Microsoft’s Zune media service was discontinued in June but tomorrow is a new dawn and a new day for Microsoft’s iTunes and Spotify ousting plans as it launches Xbox Music. Tomorrow the service will go live on the Xbox 360 with a dashboard update. The new service will offer users a choice of 30 million songs to listen to. Xbox Music offers up a hybrid service with free streaming (with ads if not a paying subscriber), internet radio artist mixes and an online store to simply buy digital downloads. Microsoft describe the Xbox Music service as “A brand new all in one service, built from the ground up, to meet all your music needs across your tablet, PC, phone and TV.” Yusuf Mehdi, corporate vice president of Microsoft’s Interactive Entertainment Business Marketing and Strategy, says that Xbox Music “combines the best aspects of free-streaming radio, music subscription services and music purchasing options, all in one elegant package”. Since it’s an all in one solution users will no longer have to suffer from “service hopping” according to Microsoft. The service launches on the Xbox 360 tomorrow and will be available to Windows 8 and Windows RT users from Windows 8 GA date (26th October). A little bit later when Windows Phone 8 launches you will get this same Xbox Music service on your brand new shiny WP8 smartphone. The free unlimited streaming on Windows 8 devices is supported by advertising, however Microsoft says that the whole 30 million library of tracks is accessible to Xbox Music users and “it’s the only operating system on a tablet that can do free streaming because of the rights we’ve secured,” says Mr Mehdi. It’s a cloud based service so the playlists, favourite artists and radio stations are the same on your PC or tablet. For comparison sake, Apple’s iTunes service has a library of approximately 26 million songs. The Smart DJ radio mix functions of Xbox Music with “artist based radio” featuring chosen artist(s) and “related content” look to be a lot like the Nokia Music app’s mix radio functions on current Nokia Windows Phone devices (WP7.5). An Xbox Music subscription costs $9.99 (or £8.99 in the UK) for one month. This payment gives a user ad free access to the music library. Also it enables the ability to access your collection on Windows Phone 8 devices and Xbox 360 in addition to your PC and Tablet. There will be a 30 day trial of the paid for service available to new users. Paid downloads from Xbox Music will be in 256kbps DRM-free MP3 format. There will be a library of music videos as well as plain music files. Tomorrow when the service is launched Xbox 360 owners will have a choice of 70,000 music videos to peruse. 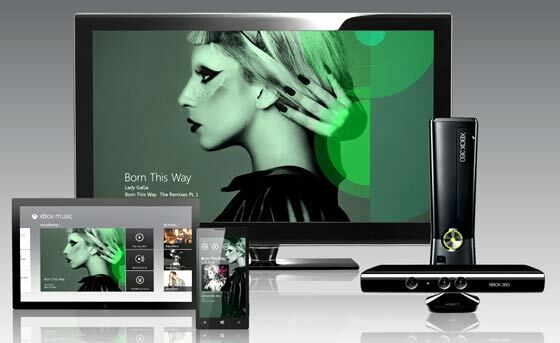 The Xbox Music service will be available in 22 countries including Blighty. Xbox Music Apps for iOS and Android are expected sometime next year. Speaking of Zune… anyone know if some kind of successor device will come out any time soon? All of the coverage has been on the phones/tablets and new not-really-a-desktop environment. Surely a Zune-like niche not only exists in the MS line-up (in the same way that the iPod touch coexists with the iPhone and the iPad) but is also far more logical a fit than the original Zune ever was. Again, MS could make a flagship device, then leave the rest to 3rd party manufacturers. Yes I know that a phone or tablet could play .mp3s etc. but sometimes I want more portability than a 10" tablet and the ability to not run my phone battery down when I may need it later. Hmm, I can't help thinking that there's a missed opportunity here - rather than merely do it as a Spotify competitor, why not also offer it as an add-on for existing XBL subscribers? We've got a Family subscription here (4 users) so if, for example, we could “music enable” that for a fiver a month (paid in advance of course) then I'd be very interested. Interesting, especially if they don't ram FB down your throat - which is what caused me to cancel my Spotify. I think they need a £5/month option like spotify has where you can stream an unlimited amount without ads. And perferably a pay upfront for a set time option. I hate setting up DDs because companies abuse it by making cancelling hell on earth.